Oldest Post Office in Baroda was located in Cantonment area, to the north west of the city area and was known as Camp P.O. Earliest mention of postal event in Baroda was an establishment of twice-weekly dawke (Mail) to Brodera (i.e. Baroda from Bombay by the postal notice dated 29th June 1802. After the establishment of Bombay GPO in 1830, Bombay Post Office rules were introduced and a list of post offices in India was published. As per the list of post offices published in Bombay Gazetteer of the same year. The list has mention of a Camp Post Office, which was located in Cantonment area, outside the Gaekwar territory of the erstwhile Baroda State. It is not known in which year the Camp Post Office was opened at Baroda Cantonment. Till 1863 there was no other post office in Baroda City for the convenience of the residents of city area. Only a letterbox was installed in the city for mailing the letters. For buying the stamps and for registered post people had to walk to Camp Post Office. In 1863 the H. H. Gaekwar Government entered in to an agreement with British Postal Authority for establishment of postal arrangements in Baroda territory. After opening post offices in other towns of Baroda State, British Authority with the intention to provide postal facilities to the inhabitants of Baroda City thought of opening Receiving House in the heart of the city of Baroda. In November 1863, R. Wallace, Resident of Baroda approached the H. H. Gaekwar Government for obtaining the permission to open a Receiving House in the Mandvee area. But the Durbar was unwilling to accord sanction to its establishment within the city area, on the ground that the gates were being kept closed at certain hours in the night might impede the working of the post office sometime. The state authority had no objection of opening the Receiving House in the Raopoora area (Raopura) but not in the city of Baroda (i.e between four gates of the city). It was also conveyed that the postal work could be allowed at the Chabootra of the said suburb. The Inspecting Post Master of Guzerat (Gujarat) stated in his letter No. 276 of 1864, dated 27th April, 1864 addressed to Major H. R. Hothway, Assistant Resident of Baroda, that "the establishment of a branch post office in the city would be in a great measure benefit the people. In other foreign territories, there are Government Post Office and the people of Baroda themselves are very anxious to have a post office in the city". He also suggested that the Receiving House should be established at Limra Chowk area which was outside the city but not so distant from Mandvee. Nothing further appears to have been occurred till 1867. With reference to Colonel Wallace’s letter No. 614 dated 25th November last, I have to honor to state that the establishment of a branch post office in the city would in a great measure benefit the people, in other foreign territories, there are Government Post Offices, and the people of Baroda themselves are very anxious to have a post office in the city. 2. The Durbar has no objection to have a receiving house opened at Raopoora and is unwilling to accord sanction to its establishment with in the city, but Raopoora is situated very distant from Mandvee, the inconvenience to the people would be nearly the same. I would therefore beg to suggest that it be established in Limra Chowk, which place is certainly outside the city but not so distant from Mandvee as Raopoora is. 3. I shall therefore feel obliged by your kindly obtaining the sanction of the Durbar to my establishing a Receiving House in the above locality. On 16th December 1867, Mr. F. R. Hogg, Offg. Post Master General, Bombay paid a visit to Camp P.O. at Baroda Cantonment. He noticed that large proportions of mails were posted in the city compared to those mailed in the letter box placed at Camp Post Office. He also remarked that an average of seven letters were registered everyday by inhabitants of the town against one only by resident of camp. Practice of posting bearing letters was common among residents of city area, as the purchase of postage stamps in the city was not possible. The Post Office being in the Cantonment of Baroda, many of the inhabitants did not receive its benefit freely. Mr. Hogg was anxious to open a Receiving House in the city where all the postal services could have availed by the residents of Baroda City and walk up to Camp post office could be avoided. Communication between British authority and H. H. Gaekwar Government continued for a long time. The H. H. Gaekwar was not willing to allow the post office in the Mandvee area and the matter was dropped. On visiting the post office at this place I was surprised to observe the large proportion (500) of covers posted daily in the city as contrasted with those dropped in the letter box of the Camp post office (220). An average of seven letters are registered everyday by inhabitants in the town against one only by resident of Camp. In respect of Bhangy Parcels the same difference exists and the trouble some practice common among natives of posting bearing letters is encouraged by the fact that the purchase of postage stamp in the city is not possible. 2. With so large a Departmental Revenue, greater postal facilities should be given and I am therefore anxious to open Receiving House in the city where letters can be posted or registered, parcels given and received, postage stamps sold and enquiries on departmental questions heard and answered. 3. All this can be effected by placing one post office clerk in the small shop in the bazaar but this I am informed is objected to by His Highness the Guicowar. 4. 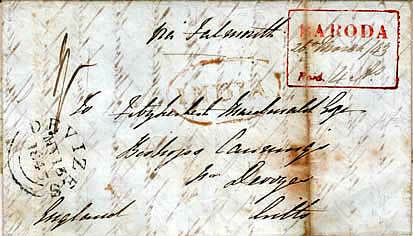 I therefore trust to obtain your aid in the matter and hope that you will point out to His Highness that the sole wish of my department is to save his subjects a walk of two or three miles to the Camp Post Office and that the Post Office clerk in the city will only there carry on the identical work which be now performed in Camp. Once again on 13th June 1871, the Inspecting Post Master, Guzerat Division sent a note (No. 350 of 1871) to the Resident of Baroda and requested him to approach H. H. Mulhar Rao for allowing a place near Mandvee. Once again the result was not fruitful. In March 1874, Offg. Post Master General, Bombay approached to the Secretary to Government Political Department, Bombay and requested him to communicate with the H. H. Gaekwar on the subject. Till October 1874 British Postal Authority could not open Receiving House in desired area of the city. Finally by Durbar Yadi No. 2022 dated 9th November 1874 the H. H. Gaekwar Government stated that the Postal Department can hire a place for a post office any where they like and hold office there but it should be outside the Lahereepoora (Lehripura) gate. gate. The exact location of the Receiving House is not known but an old map in Baroda Archives shows a location of post office in Limra Chowk area. Probably it was renamed to Baroda City P.O. and again renamed to Laheripura S.O. in November 1927. Information about the opening of Baroda Head Office is not yet known but the Postal Guide of 1880 and 1882 states the existence of Baroda HO, Baroda City (Receiving House) and Baroda Camp Post Office. In March 1892, Mr. W. P. Symonds Post Master General, Bombay had requested the Agent to the Government of Baroda to initiate communication with H.H. Gaekwar Government for erecting a new building for Baroda H. O. He also stated that the existing building did not had sufficient accommodation for the office and a new suitable building was required. The location of the Head Post Office is also not known. One letter of Mr. F. D. Kamdin, Superintendent of Post Offices, Kaira Division addressed to His Excellency Diwan Bahadur of Baroda State dated 3rd October, 1907 states that the Head Post Office and Telegraph office at Baroda was held for past 30 years in the building owned by Mr. Appoo at Raopura from which we can presume that H.P.O. might have established around 1877 in Raopura area. Again in 1904 the Resident of Baroda had suggested the H. H. Gaekwar Government to erect new H.P.O. building and three sites were suggested for the same. One at ground opposite to Band Building between Makarpura and Nagarpada Road, second opposite to Rajmahal and New Police Guard Station and third near Panjara Pole. The Gaekwar Government did not approve these sites. Communication on the subject continued for a long period. In 1907 the building where Head Post Office and Telegraph office was situated, collapsed due to heavy rain and it was temporarily shifted near Kothi to Mr. Borkar's Bunglow. The building was temporarily occupied for a period of 12 months ending 4th September 1908. In the same year Mr. F. D. Kamdin, Superintendent of Post Offices, Kaira Division submitted a plan for proposed building for Head Post Office to the Gaekwar Government and suggested three new sites. One near Kharchikar's Wada, second at Facing the Kharivav Road and third at Bhaskar Rao Vithal's Paga near Anandpura Police Chowky. H. H. Gaekwar Government was not ready to undertake construction of building but was prepared to place at disposal of the postal authority, any of the two sites (1) Near Kharchikar's Home in Raopura and (2) Bhaskar Rao Vithal's Paga. It was also suggested that the postal authority should construct the H.P.O. building keeping in view with the state buildings in architectural style. Meanwhile in April, 1908 Post Master General, Bombay sanctioned construction of Head Post Office Building close to Nawab's Haveli on Chimnabai Tower Road. 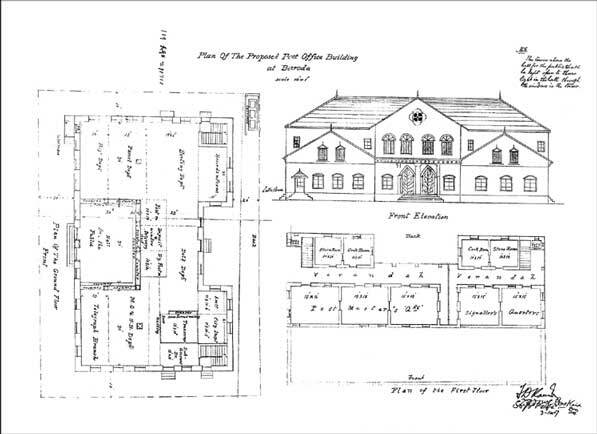 The landlord Mr. Chhaganlal Parikh agreed to give the new building ready by September 1908. A pucca building with brick walls and tin and tile roof was constructed on Raopura Road comprising of Telegraph Office, Sorting Room, Post Master's room, Treasury room, clerk's room, runner's room and godowns. Working of the Head Post Office continued in the same building for a long period. Once again in February 1922 the Resident at Baroda initiated communication with Gaekwar Government for the erection of Head Post Office at the junction of Kothi Road and Jail Road. In March 1922, H. E. Dewan of the Baroda State agreed to the erection of New Head Post Office building, considering the project as an investment and directed the Post Master General, Bombay to submit specifications for the building. On 26th September 1922 the approval for the construction of the new building was granted and finally in August 1934 the construction of new Head Post Office building opposite to the east of Suryanarayan temple (present location of Baroda H.O.) was completed. The Head Post Office was moved to new building from 1st September 1934. On moving to new building Window deliver system was ceased and Post Box system was introduced with a fees of Rs. 15.00 per annum. 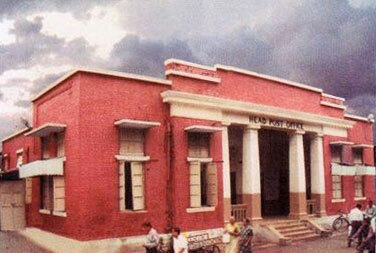 H. H. Gaekwar Government gave the building of Head Post Office to the Postal Department on lease. The lease agreement was prepared on 20th January 1937 and was signed by the Chief Engineer of Baroda State on behalf of the Government of H. H. the Maharaja Gaekwar of Baroda and the Post Master General, Bombay on behalf of the Secretary of State for India in Council. The tenancy was effective from 1st October 1934 for a term of 30 years. Apart from other terms mutually agreed upon, the monthly rent of Rs. 244/- was fixed for the building. 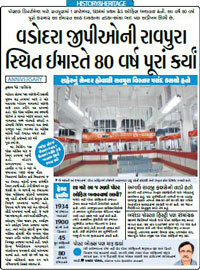 Story on 80 Years of Vadodara Head Post Office published in Gujarati Newspaper 'Divya Bhaskar' dated 6th September 2014. I request all the members and readers to communicate with me if additional information is available on the subject. This article was first published in Vadophil, Quarterly News Bulletin of Baroda Philatelic Society, No. 87 (July,2001) and in Baroda Times (Times of India) dated 12th July, 2001 under title "Tracking Vadodara's First Post Office" and also in the Souvenir of GUJPEX-2003 in October 2003.